It's a big change for the beloved brand. America runs on Dunkin'. And pretty soon, that's all it will be running on. The breakfast and coffee chain is officially saying goodbye to the "Donuts" part of its name, beginning in January 2019. The company, which has 12,600 restaurants located around the world, unveiled the name change at its Global Franchisee Convention Tuesday, and a press release stated that the updated branding is part of the chain's plan for growth, focusing on its drinks and new on-the-go offerings. 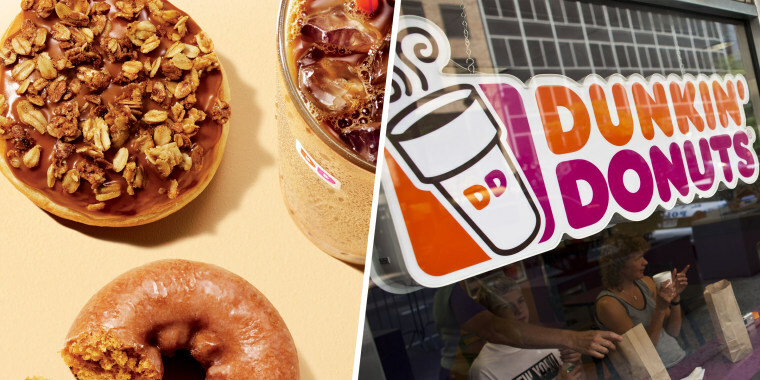 Dunkin' Donuts recently introduced new Dunkin' Run menu items like Donut Fries and Waffle Breaded Chicken Tenders, but it's been a popular place for boasting a variety of custom coffee flavorings. The company's logo will also get a redesign, however it will maintain the same bright orange and pink colors and blocked font associated with the chain. The new branding will be used on all new and remodeled stores in the U.S. and, eventually, internationally. According to the Boston Globe, the company began dropping the word "Donuts" from Boston-area stores in 2017, much to the dismay of many customers. TODAY Food also caught wind of the change in 2017 at some of its new California locations. “By simplifying and modernizing our name, while still paying homage to our heritage, we have an opportunity to create an incredible new energy for Dunkin’, both in and outside our stores,” said Tony Weisman, chief marketing officer for the new Dunkin’ U.S., in a press release. So far, the response to the change online is mostly, well, pretty funny. They should change the name to dunkin muffins. The blueberry and corn muffins are pretty good. However, doughnut fans need not to worry! The brand, which is the No. 1 seller of doughnuts in America, says its famous doughnuts aren't going anywhere despite the word being dropped from the official name ... even though it did axe some flavors in 2017. Dunkin' Donuts says the next seasonal release of flavors will be Halloween-themed doughnuts and they'll be available in stores this October.